It’s that time of the year – testing time. Freshmen and sophomores will be taking the Alaska Measures of Progress (AMP) exam April 1-10. Students will take four English tests Wednesday through Monday along with four math tests starting on the following Tuesday through Friday. The tests will take place in two computer labs and students should bring headphones if they have them. Counselor Mr. McClory has been working frantically to make sure the school is prepared for the exam that is replacing HSGQE’s. Because the HSGQE has been discontinued, some upperclassmen are upset after being encouraged to take it seriously and do their best. Junior Leif Svenson said he was excited at the possibility of having a week off while underclassmen took the test he had to take the previous year. Kayhi girls started the state tournament with an 58-56 double overtime win over East in first round. Eliah Anderson hit a game winning jumper at the buzzer to win it. Then the Lady Kings had a rough patch against Dimond 70-46 and lost in OT for the 3rd place game against Colony 53-48. The Lady Kings finished 5th at state and received the sportsmanship award. The Kayhi Kings had a close game vs East but fell short 75-68. The boys team won their first consolation match against Wasilla 67-61, but was then defeated by West Valley 63-56 in the 4th place game. The Kings took 6th at state. The number of students represented at the parent teacher conferences, dropped 13% from the total in the fall. Last Fall, 217 students were represented on the first night, and 146 on the next; totaling a 58% representation of the 616 student enrollment. Also, the school used the new Powerschool system which sent out an automated message to every family, rather than relying on a mail based notification. This Spring, the total attendance was lower, as expected, with 172 students represented on Tuesday and 97 on Wednesday. The total number represented was 269 out of a total enrollment of 591, meaning a 45% representation. Kayhi ACDC poses with their team medals after the state meet. Kayhi’s ACDC team placed in four categories at the state competition in Anchorage last month. 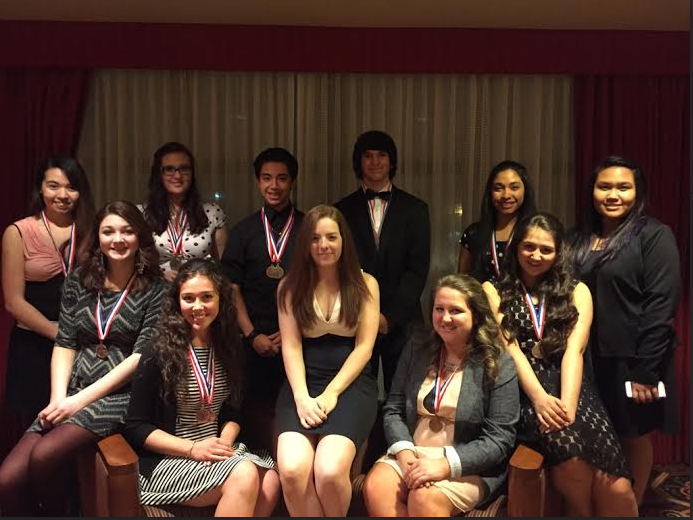 In the interview category senior Tommy Varela won gold, and senior Carly Royer won bronze. In the social science category junior Liz Vossen took silver. The team placed third in the super quiz. ACDC coach Peter Stanton said he was happy with the performance and looks forward to next year. Karly Blair and Carly Royer are the ACDC team co-captains and they said the team did its best. There were a total of seventeen teams from all over Alaska and our team competed in 10 different categories. The Lady Kings avenged Friday nights loss to beat Thunder Mountain 68-62 in overtime to take first in Region V Tournament. Charley Edwardson led Kayhi with 26 points on Saturday night. This is the second year in a row that the Lady Kings have won the Region V Tournament. The Kings went undefeated in the Region V Tournament last week against Thunder Mountain to win the title. The first game Kayhi won 60-57 in double overtime against the Falcons. 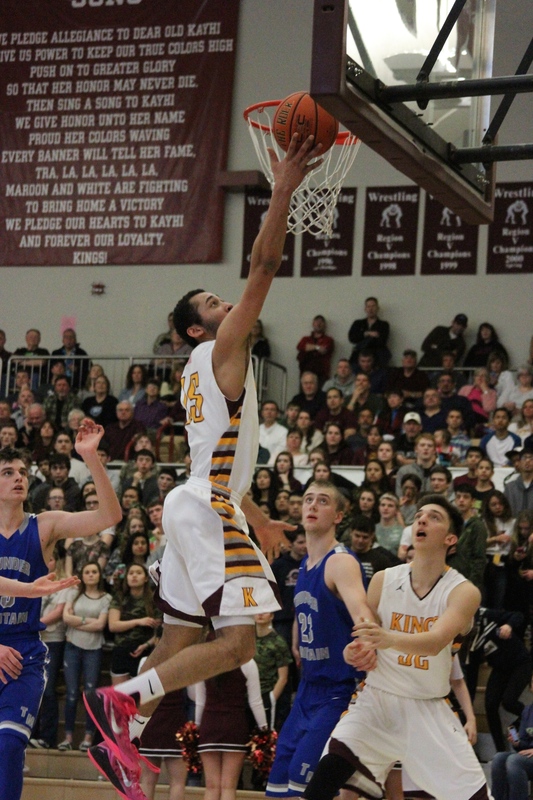 In the championship game Friday, the Kings jumped out to an early lead and won 75-56. It had been 10 years since the Kayhi boys basketball team had won a region title and Coach Stockhausen first time ever. Both teams will be heading to compete in the state tournament next week (2/17). Metlakatla won both Championship match ups with Craig to sweep the 2A titles. The girls won 52-33 and the boys took down the top-seeded Panthers 52-47. Sitka beat Mt. Edgecumbe on a pair of last second free throws to claim the 3A title 43-41. The Sitka girls punched their ticket to state by opening the game on a 15-2 run and holding off Petersburg 49-39.